Wayne Strickland died in the M8 collision between two cars, a lorry and van. This is so very sad. Yesterday I wrote ‘1 dead, cars on fire – M8 Edinburgh – I was there’ <Click) There are a few images and videos in there. I got a hard time from a few people but once we spoke they understood that blog. I was there in terms of, a mile away and stuck in traffic for 5 hours in pain. BUT!! All the time I waited my mind was thinking “Who died” 😦 Because that is pretty much all any of us knew, the traffic was so slow drivers were out cars speaking to each other, and all we knew when I did the video was ‘A person had passed. This swept from car to car as I seen people’s heads drop and some cry. It was that real, and so sad. My heart and soul go out to Wayne’s family. I can only offer words of comfort and I will. Below is from a decent media outlet STV (Scottish Television) for people reading this from foreign shores. 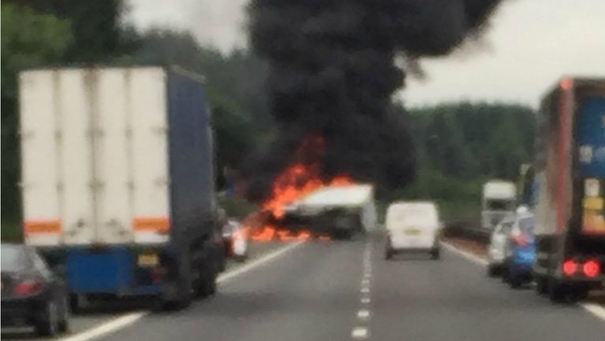 A man who died after his car burst into flames in a crash with another car, lorry and van on the M8 has been named. The 49-year-old man, named by police as Wayne Strickland, from Fife, died in the four-vehicle crash on Monday between Bathgate and Livingston. The incident happened around 8.45am which left the cars and HGV destroyed by the blaze. Firefighters extinguished it shortly before 10.30am. A Peugeot 206, which Mr Strickland was driving, a Kia Rio, Mercedes van and an articulated HGV were all involved in the collision. The motorway was closed for most of the day while emergency services tended to the injured and cleared the scene. Two people were taken to hospital while a number of “walking wounded” were treated by paramedics by the roadside. A spokesman for West Lothian Council said: “Wayne was a very popular and respected colleague and those that worked with him have been left devastated by this tragic news.”Wayne had worked with West Lothian Council for a number of years and those that had the pleasure to work with him feel very fortunate to have known him as a colleague and friend. Twenty members of the Scottish Fire and Rescue Service were in attendance, with six of them wearing breathing apparatus and using high pressure hoses. Motorway closed after man is killed in Scotland – Why the music? A man has died after a van caught fire in a crash with two cars and an articulated lorry on Scotland’s busiest motorway. The incident happened around 8.45am on Monday between M8 junction 3a (Bathgate) and junction 3 (Livingston) eastbound. Both cars and the HGV had been destroyed by the blaze which was extinguished shortly before 10.30am. Two others were taken to hospital suffering minor injuries and it is believed the motorway could be closed until 5pm. Twenty members of the Scottish Fire and Rescue Service were in attendance, with six of them wearing breathing apparatus and using high pressure hoses. Diversions before and after the junction were put in place after 10am. Traffic Scotland tweeted just after 4.30pm saying the motorway had been cleared. Avoid the #M8 tonight folks. Been qn accident and there's huge traffic queues in both directions. @Ross_Oliver23 Evening Ross, unfortunately yes but the #M8 is now open so we hope the residual traffic will clear soon 😦 Thanks, Bex. @ktmcnair Due to the #M8 closure, the area has been very busy all day 😦 Hope you get home soon. Thanks, #StaySafe. Bex. @73Derekb Hi Derek, the #M8 is fully closed, all route are incredibly busy but the #A71 is your best bet, expect delays 😦 B.
SNP forces Palace to back down in cash row – AS I PREDICTED! Now please cast your mind back to December 8th 2014 and you will see I wrote this article here ‘Nicola Sturgeon refuses to pay the Queen! Go on Nicola! <Click) An article many scoffed at and ridiculed the mere mention of Scotland stopping paying for the Royal Families upkeep. Where did I get the story in the first place? Well I research hard, I do say this often 😀 As Nicola and the SNP made a decision that will humiliate Buckingham Palace and Westminster, basically Whitehall 😀 This leaves the question of “What will the Unionist’s do” Now what I do mean is the people who won the ‘September 14th 2014 Referendum’ on Scotland voting herself free away from the British Union. Remember the winners? The 55% were the winners and a small percentage of the ‘No Movement are behind the Queen and all she stands for! Are kinda Protestant as they kinda sing to us ish, yet they never go to church, so this small percentage don’t seem the brightest right <Click) I say a small percentage because I hope so. These are Scottish born people singing ‘God Save The Queen’ so lets get one thing clear, I have no problem with someone born in the UK, I am British through birth just now myself, singing this song, in-fact I encourage being a Nationalist or to be proud of where you come from, there is nothing wrong with that. I said before in another blog, I can’t remember when I pointed out ‘It’s not about our flying the flag, it’s why we fly the flag’? Is it hatred? is it national pride? the reason we wave flags? You have your own answer I hope. Because these are the reasons we need to know Scotland. With no hate we try and co-exist and do what’s right for our kids future yet these people, BACKED BY THE MEDIA!!! Almost control. Every day call for the Scottish Unilateral Declaration of Independence things due to where they lean. Make sense? Please say yes! They got NOTHING. Yes voters are fighting for a lie they fell for! So Scotland do we want to pay for all this, or do we want to have less Foodbanks? An already brilliant Education System made better? A better National Health Service although it’s all £Free up here, less bombs and more done for the bairns, disabled old and people life just beat up?? Where do you want your Tax money go? You be sitting thinking “I don’t work, what do I care” But you know you pay Tax buying any item on Earth right? Just saying! I know this blog might bring the usual hard men and comments I yawn at and all the hate you can imagine, but really I am ok with it all, people who want to harm you don’t give you a weeks notice in email 😀 In peace and solidarity with anyone in the World who is been stood on by the ignorance of the rest, we stand in Solidarity. Know 1 think my Loyalist in Scotland! Very soon you become a minority in Scotland the same as the Tory and Red Tory alike! It is understood that the Scottish parliament intends to retain the profits from the crown estate in Scotland for use in Scotland, which could have the consequence of reducing the sovereign grant, which funds the monarchy. Buckingham Palace intends to raise the consequences for the Queen with David Cameron and George Osborne. A Buckingham Palace spokesman said it was wrong to infer that Scotland would no longer contribute to the monarchy based on the change to the operation of the crown estate and its impact on the grant received by the Queen. The spokesman said it was an “entirely hypothetical” situation, and that though the sovereign grant was calculated on a percentage of the crown estate income, “there is a formulaic connection between the two, but there is no financial connection between the two”. The sovereign grant – which apart from security costs represents the main public funding of the monarchy – was introduced in 2011 to replace the annual civil list and property and travel grants. It is based on 15% of crown estate profits from two years previously, but its amount cannot drop below the previous year and the exact percentage is renegotiated every five years. It is due for review from April 2016. The crown estate income was surrendered to the Treasury in return for an annual civil list by George III. The Queen’s accounts show a 6.7% increase in funding last year to £37.9m, of which she spent £35.7m, setting the rest aside in a reserve account. Was Renton from Trainspotting correct? @ShaunyNews @Clarkson77 @theSNP Silence or outright derision directed at us. You're right, it is a crap state of affairs! Nadir Ciftci is determined to become a hero for the Celtic supporters after clinching his dream move to Paradise from Dundee United. The striker put pen to paper on a four-year deal with the Scottish champions last Thursday to become Ronny Deila’s fourth signing of the summer. The new Bhoy could make his competitive bow tonight (Wednesday) as Celtic kick off their Champions League campaign against Icelandic side FC Stjarnan in the second qualifying round. “I’m very happy to be here and I’m looking forward to playing for this club,” said Ciftci in an exclusive interview in this week’s Celtic View. “I have been able to play against the team for two years and I realise how big a club this is. What excites him most about moving to the club, however, is the prospect of starring in front of the Hoops faithful on a regular basis. As an opposition player, he witnessed the difference their inspirational backing made in matches and he believes they can roar him on to greater heights as a player. “The most exciting thing is the supporters,” he told the View in an exclusive interview. “We all know what kind of fans we have here and I can’t wait to get out there and enjoy their backing, and hopefully I can give a lot back to them as well. “I know we have superb fans at this club and hopefully I can get the same support from them and give them something big on the park. This is what football is all about. They are the 12th man and they can have a big impact on the football. “Messi doesn’t come in and say out of nowhere that Celtic Park was the best atmosphere he has played in. Everybody around the world knows this is the case and to be able to play for the supporters and not against them will only be good for me. Ciftci has chosen the iconic No.7 jersey – a number worn by legends like Jimmy Johnstone and Henrik Larsson among others over the years. Stepping into their shoes doesn’t faze him.